Here’s a novel idea. A show about aliens threatening the Earth’s population. But it needs a really catchy title…something that’s never been used before. I’ve got it: The Visitors! And let’s put somebody behind it who’s never worked on an alien project before, like maybe Steven Spielberg. All of this unfunny sarcasm adds up to ABC’s upcoming drama from Amblin Entertainment, with Spielberg as executive producer. 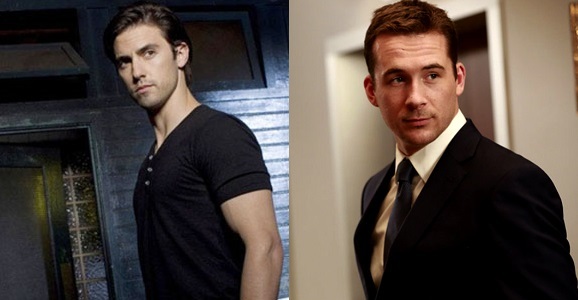 Announced a couple of weeks ago, the show has attracted a few cast members, including Heroes alum Milo Ventimiglia and Revenge star Barry Sloane, both of whom join the sci-fi friendly actor Derek Webster (Stargate). At least they didn’t just import the entire cast of the 2009 reboot of V, though that in and of itself is kind of an original idea. The Visitors is ostensibly about aliens who want to destroy the planet, using children as their weapon, but that kind of plot probably can’t hold steam from week to week. Ventimiglia will play a man named Drew Brannigan, only he doesn’t realize that’s his name. He wakes up on the streets of Washington D.C. without his memory. He finds a series of tattoos on his body that lead him to his name, but that’s it. It turns out he has a wife named Claire, and he must fight to “regain his memory or cross over to the enemy’s side.” I’m not sure exactly who the enemy is here, unless they’re talking about the aliens, who are almost certainly behind his memory loss. Sloane plays a D.O.D. investigator who stumbles upon some huge discovery. There’s no word on whom Webster will be playing. Chances are I’m going to watch this show as soon as it comes out, so I don’t know why I bother complaining about how stale the plot sounds. If it’s got an alien in it, I’m on board for at least one episode. And the pilot is being directed by Mark Romanek, best known for this chilling 2002 thriller One Hour Photo and his lengthy music-video career. Writing duties fall to Soo Hugh, who has written episodes of A&E’s The Killing and CBS’ Under the Dome. Even though we won’t be seeing Ventimiglia anymore on TNT’s recently cancelled Mob City, he’s currently killing it on the Crackle original series Chosen. He’ll be making a bigger name for himself on the cinema side as well, with roles in Olivier Dahan’s Grace Kelly biopic Grace of Monaco, Simon West’s crime thriller Heat, and Anna Mastro’s comedic drama Walter. He’ll also be joining sci-fi-friendly faces Katee Sackhoff, Alan Tudyk, and Robert Patrick for the crime drama Tell. And who knows if he’ll be a part of NBC’s upcoming miniseries revamp Heroes Reborn? Sloane, meanwhile, doesn’t have nearly as busy a schedule, with only Revenge and a small role in Darren Aronofsky’s Noah on the horizon. If this series makes it past the pilot stage, we’ll either see it this summer or this fall, depending on how happy ABC execs are with the finished product.